There is nothing more pleasant than spending evening in a nice company of the loved at the sparkling light of a blazing fire. 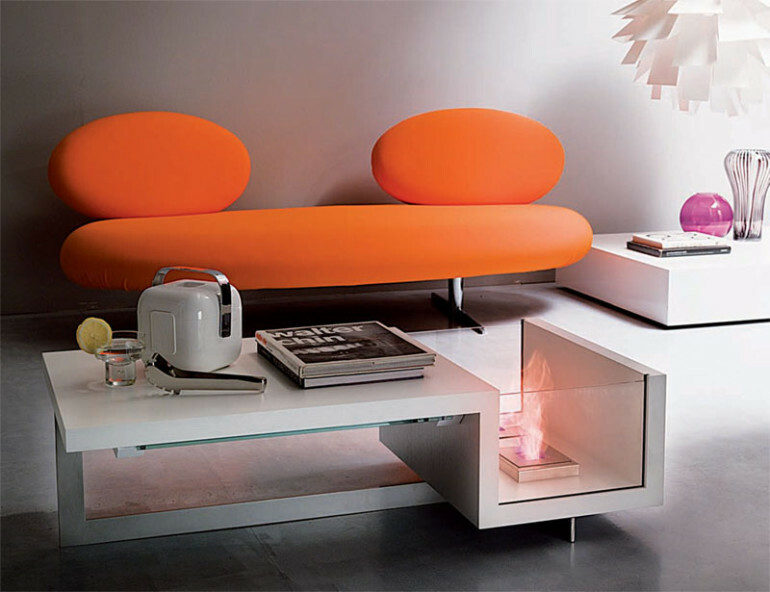 Thus, a combination of a coffee table or a bench with the function of bio fire is very popular among designers. One of the more interesting of such solutions is the Focus X075 by Ozzio Design, designed by Giuliano Cappelletti. This unique Italian design will also warm up many romantic evenings for two, because inviting your beloved for a glass of wine near the blazing fire in close proximity to the bioethanol fire will certainly remain for long in the memory. The structure of this bio fire is made of lacquered wood elements supported by a metal frame. This model is equipped with a bioethanol fuel tank made ​​of stainless steel with a volume of 5 liters, which allows for efficient burning from 3 to 4 hours. Burner is located at the bottom of the table and for safety reasons is separated with tempered glass panes from both sides. The set was fitted with a manual for mounting various bioethanol fires elements and a funnel for refuelling. Dimensions of this bio fire: length 37.5 cm x width 65 cm x height 121 cm. It may be bought for the price of about £ 1246,00.